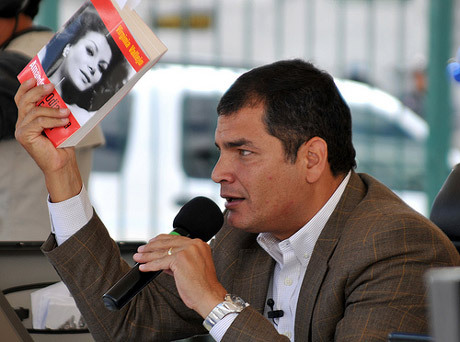 Ecuador President Rafael Correa shows Virginia’s book in camera, 2008 and 2009. Pablo Escobar is possibly the most famous criminal in recent history, and also the richest. He was a peasant, a novice politician, a billionaire, a terrorist, and the No. 1 enemy of the United States. During his reign as the head of the Medellín cartel, from 1978 to 1993, he amassed a fortune estimated at 25 billion dollars today. Virginia Vallejo met Pablo Escobar in mid 1982, and they were lovers from 1983 to 1987. 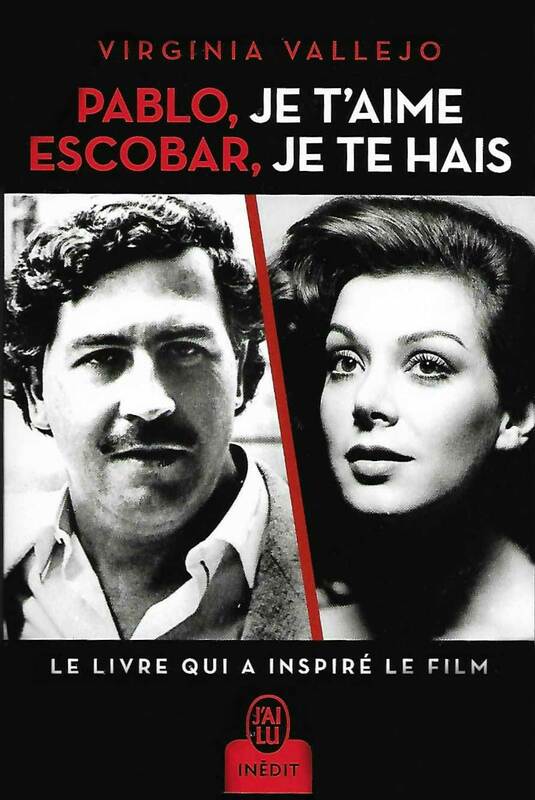 Her bestselling memoir, Loving Pablo, Hating Escobar translated to 15 languages – besides English and Spanish – is the only truly intimate biography of the head of the Medellín cartel, the only book that explains how he became so incredibly rich in just a few years, and the only love story about the legendary criminal. Virginia Vallejo is also the only biographer of the narco terrorist that has endured brutal reprisals from the Colombian government, four presidential families in the payroll of the founder cartels, the army, the paramilitary squads, and the billionaires involved in massive money laundering. When Random House Mondadori launched her book in Spanish on October 2007, it caused media frenzy. It was commented by heads of state, the FARC, human rights organizations, and international media like The New York Times, Time, and Newsweek. 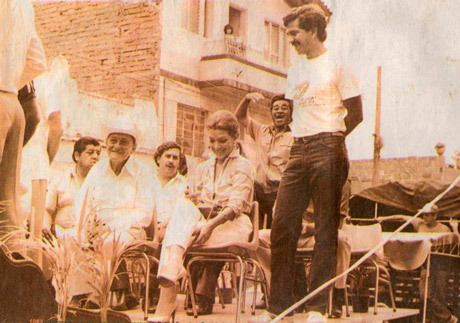 Loving Pablo, Hating Escobar is also a historical document about the corruption of political Colombian dynasties, like the Santos and López families, that control the leading media and have become increasingly rich and powerful with their control of the media, and their association with the drug cartels, oil companies, and recently Odebrecht. 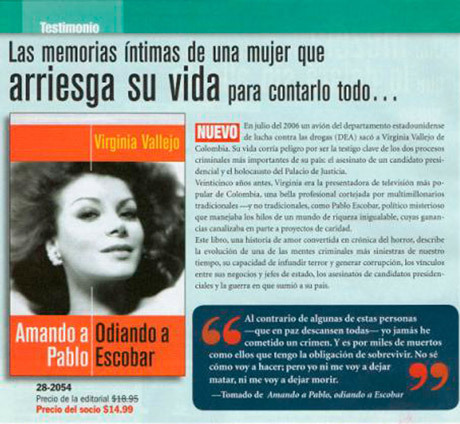 After Virginia ended her relationship with Escobar in 1987, she began cooperating with European anti-drug agencies. On July 18th 2006, a special plane of the DEA took her out of Colombia to save her life and testify in high-profile criminal cases: the trial against the Cali Cartel bosses, the assassination of Senator Luis Carlos Galán in 1989, and the siege of the Palace of Justice in 1985. In 2009, she survived a brutal attack from the government of President Álvaro Uribe and his defense minister, Juan Manuel Santos. She’s now a political asylee in the United States, and will never return to Colombia.